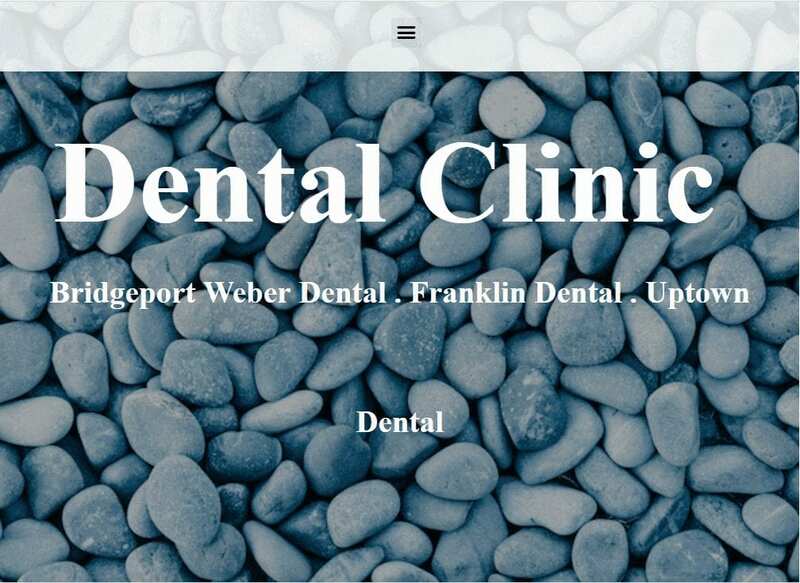 Designing a website for a dental practice can present some interesting challenges, especially when trying to make it stand out from its competitors while retaining all the necessary elements. When Impla Dental approached us looking for a solution for their website we were dedicated to giving them something that would be sleek and effective while helping them stand out. The groundwork of the design was to create a landing page that featured all three of their clinics, so we had to steer away from using an image of any of the three. Instead, we focused on a clean and concise background of beautiful river stone to compliment our selected color scheme and serve as an excellent backdrop for the information we were going to provide. The selection of color for a website is one of the most critical elements in deciding where you’ll go with its design. Grey, White, and Blue stand out as the primary colors of this site, selected for their reliability and variability in contrast. • Contrast – White is an incredible background color and when used correctly as it can provide a striking contrast for anything placed on it. Gray serves multiple purposes as an accent, a highlight, and as a primary background for readability. Blue takes a backseat role in this site, welcoming the visitor to the site and then stepping into the back to help tie it all together. • Action Oriented – White is the driving color in this site and is being used for text on the stunning navigation screen found halfway down the page and as a background for the site as a whole. Throughout gray is used to draw the eye to important pieces of information. The boxy design of the Impla Dental site ensures that information is easily visible and received and that finding what you’re looking for is a painless task. It also helps to give the site a clean look while making the best use of the available space. • Space – Space is well used and organized in this site through the use of cards, or boxes. This organizes the site both for mobile use and for use on a desktop or laptop, retaining a beautiful and orderly look. Nothing about the site is cramped or overwhelming as a result, and everything is easy to find. • Navigation – Navigation to any part of the site simply requires clicking on the hamburger menu located at the top of the screen. About part-way down the screen is another navigation option for those who prefer a more direct approach, and it’s presented in a fantastic layout. • About Us – The About Us section of this site is as straight-forward and minimalist as the rest of it, and that allows quick navigation and introduction to the staff there. They also saw fit to provide the necessary forms for the new patient to ensure that their first appointment goes smoothly. Every site design pays a certain amount of attention to the marketing aspect of the page. No matter what industry you’re in, conversion of visitors to your site into patients is key in its effectiveness. The following elements were considered in this page to help this move smoothly. • Contact Information – Having clear and concise contact information easily available is a surefire way to help drive conversion. When the urge to make an appointment strikes you want to make sure there’s nothing between them and your scheduling team. The prominent display of the clinic’s contact information at the bottom of the page accomplishes this nicely. • Navigation – Seamless navigation is vital to helping a patient feel confident in staying with the site and using your facility. This site is simplicity itself in this department, with all the information provided in clean, compartmentalized pages. • Testimonials – Word of mouth is still an essential aspect of advertising, and presenting testimonies on your site is a great way to spread the confidence and respect you’ve earned from your existing clients to potential ones. This site represents a very minimalist and to the point facility that wants to start helping patients handle their dental concerns quickly and without a lot of marketing. Direct while remaining friendly, this is an excellent site for those looking for a low-bandwidth way to provide useful content to their visitors.